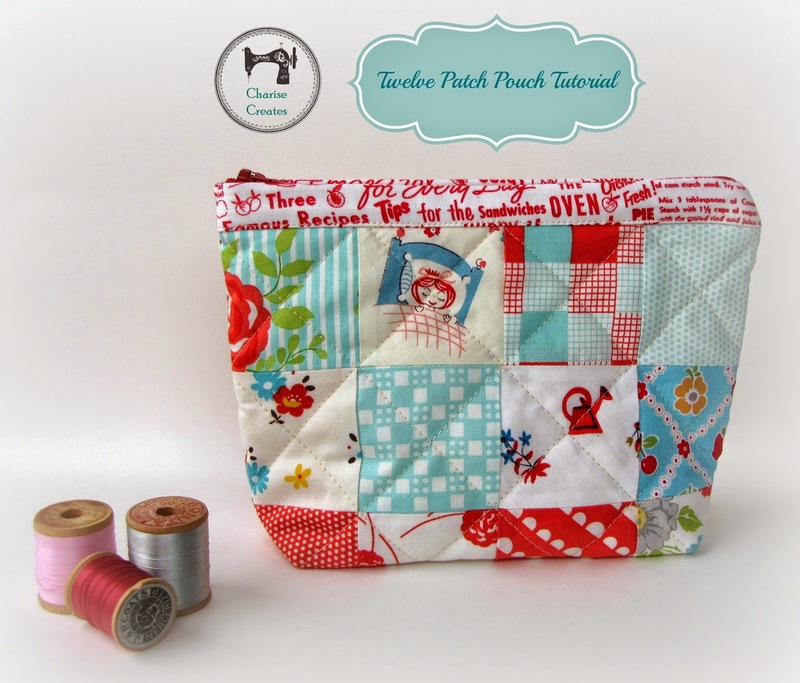 I made this twelve patch pouch a few months ago, inspired to use up a mini charm pack of 2 1/2" squares. It has a bound edge on the top of the pouch which adds a nice detail. 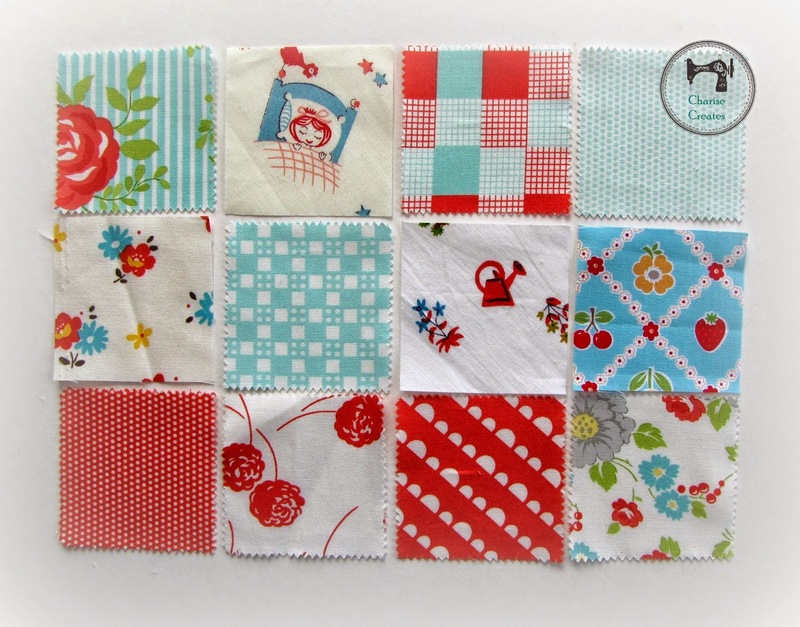 You can also use any panel of fabric that is 6 1/2" x 8 1/2". 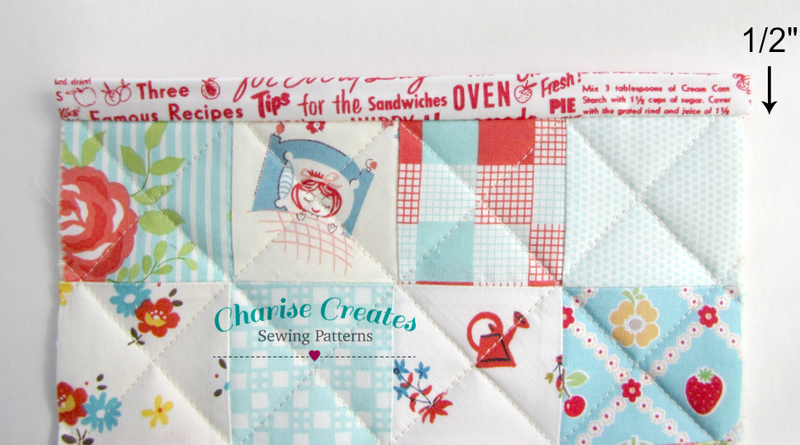 This version pictured uses a "cheater print" which looks like patchwork but it a printed panel! 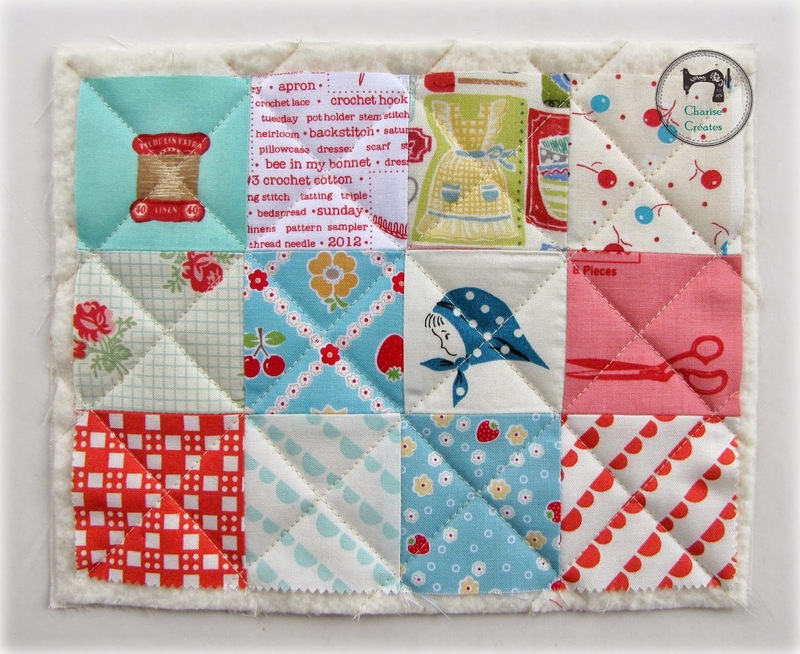 I added the appliqué fabric patches and cute strawberry button. One can never have too many pouches, so a pouch I made! My best friend has the original and I wanted one for myself, too. I have a Liberty fabric version in the works for my mom - just in time for Mother's Day. 2 rectangles lining 6 3/4” x 8 1/2"
1) Arrange the 12 print squares that make up the panel, in your desired design. 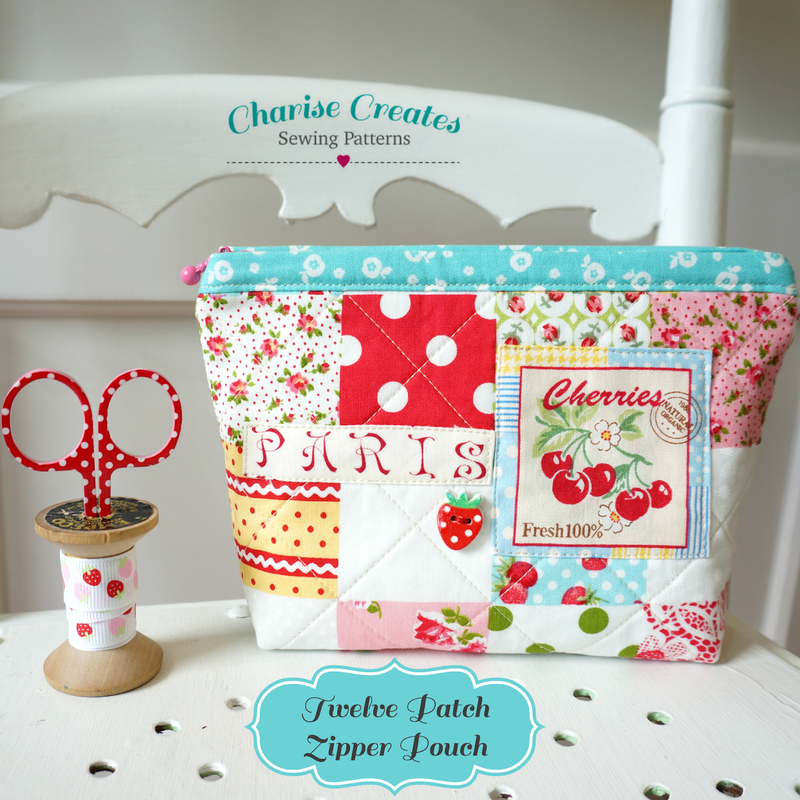 For the pouch pictured, I added in a few of my favorite fabrics mixed in with the mini charm pack. 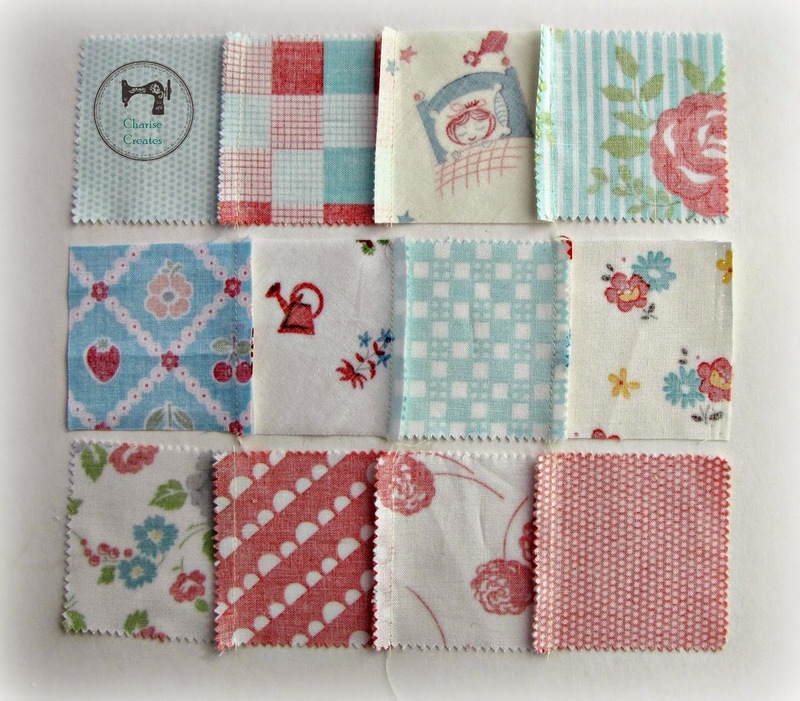 2) Stitch each row together. Press seam allowances to one side, each row in the opposite direction. 3) Stitch the top row to the center row. Press the top/center to the bottom row. Repeat for the other side side of the pouch. Place the backing fabric wrong side up. Place the batting square on top. Place the top panel right side up at the very top. Pin or baste all layers together. 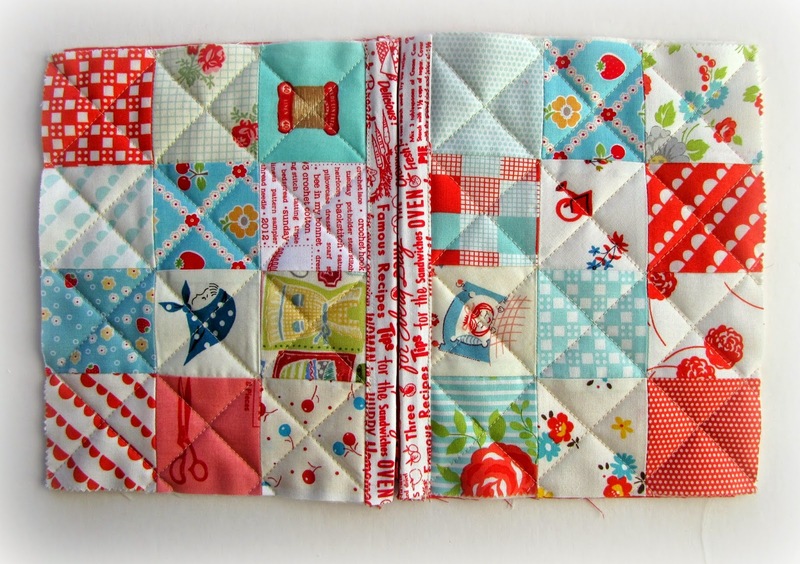 5) Quilt diagonal lines on the patchwork panel. The outside quilting lines should start 1/4” in from the edge. Your lines will be approximately 1 3/8” apart. Trim the panel to 6 1/2” x 8 1/2”. Repeat for the other side. 6) Fuse the strip 1 3/8” x 8 1/2” interfacing to the back of the print fabric strips following manufacturer directions. Repeat for the other side. 7) Place the printed fabric binding strip right sides together with the pouch panel matching top edges. 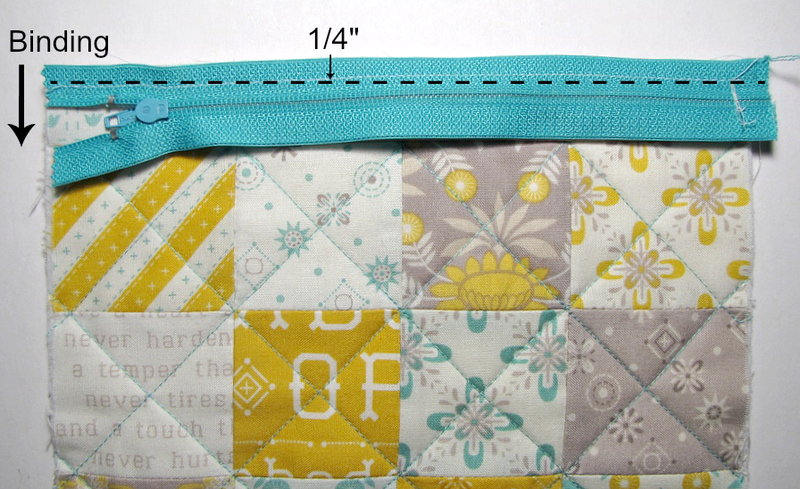 Stitch the strip to the top of pouch panel with a 1/4" seam allowance. Press the fabric binding strip towards the top. 8) Fold back the strip to the wrong side so 1/2” is showing on the right side. Press in place. Repeat for the other side. Place the zipper right side to the right side of the fabric strip matching the edge of the zipper tape to the raw edge of the strip. 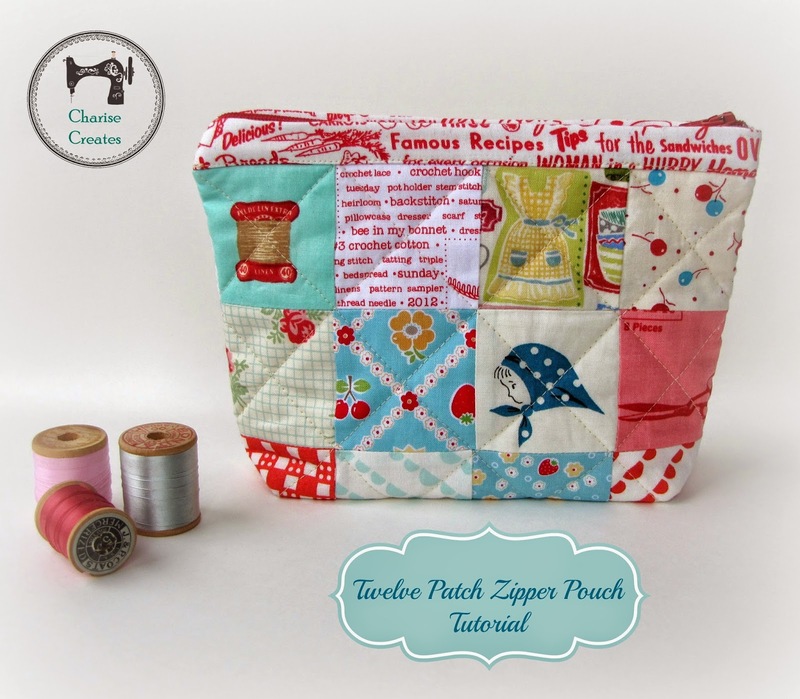 Using a zipper foot, stitch the zipper to the pouch with a 1/4” stitch. Repeat for the other side of the pouch. 10) Place the lining right sides with the right side of the clutch panel. The zipper will be sandwiched in between the Clutch Panel and the Lining. Pin lining in place along top edge. 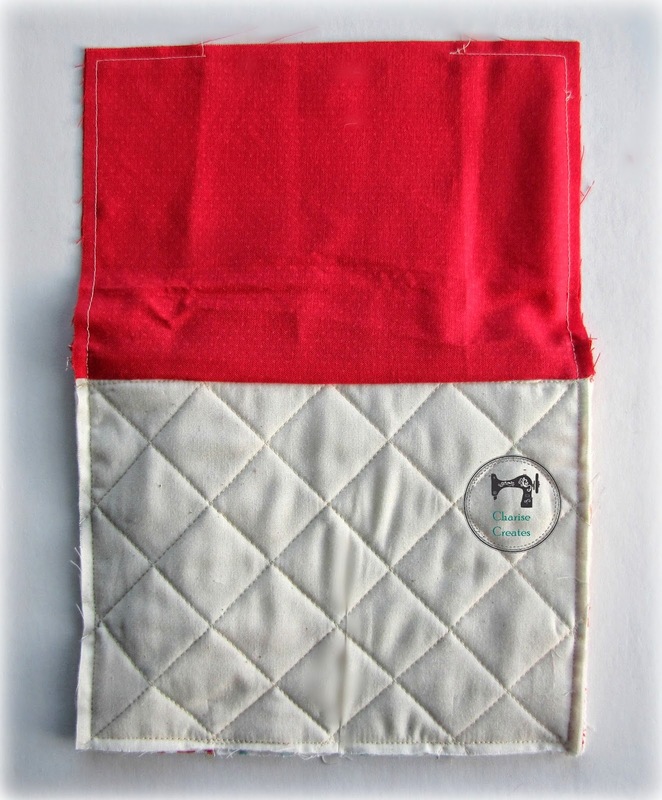 11) Flip the panel over so the wrong side of the pouch panel is facing you. Using a zipper foot, stitch 1/4” from top edge, following the previous stitching, back tacking at ends. 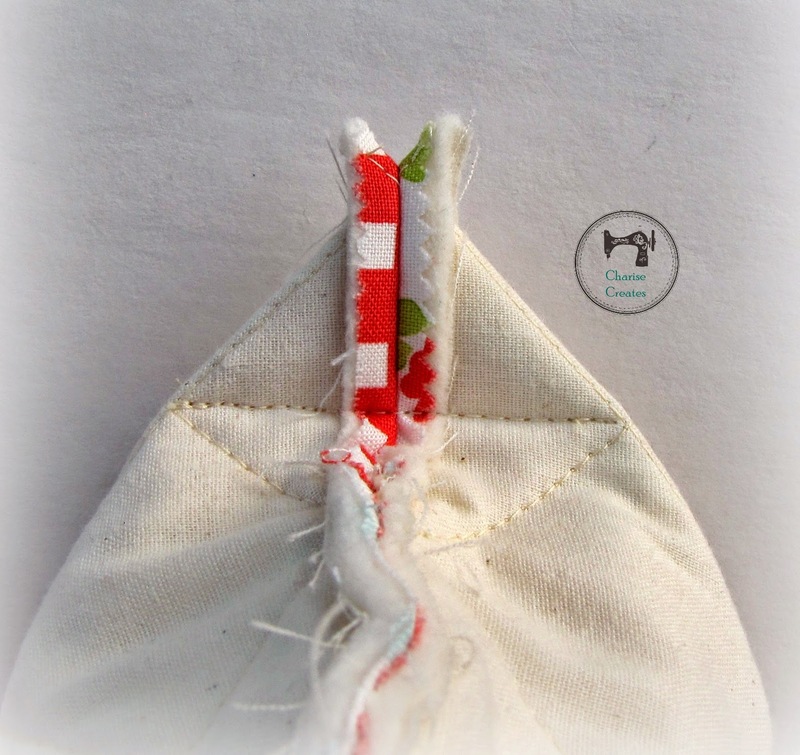 12) Turn the lining over the zipper Fold down the strip on the fold line you made 1/2” from the seam edge. Edge stitch the zipper border stitching through all layers. Repeat for the other side. 13) Separate the lining from the outside pouch panels. Place the outside panels right sides together, and the lining panel right sides together. Match seams and pin in place around the perimeter. MAKE SURE THE ZIPPER IS OPEN so you can turn right side out at the end. The zipper teeth will face towards the lining. 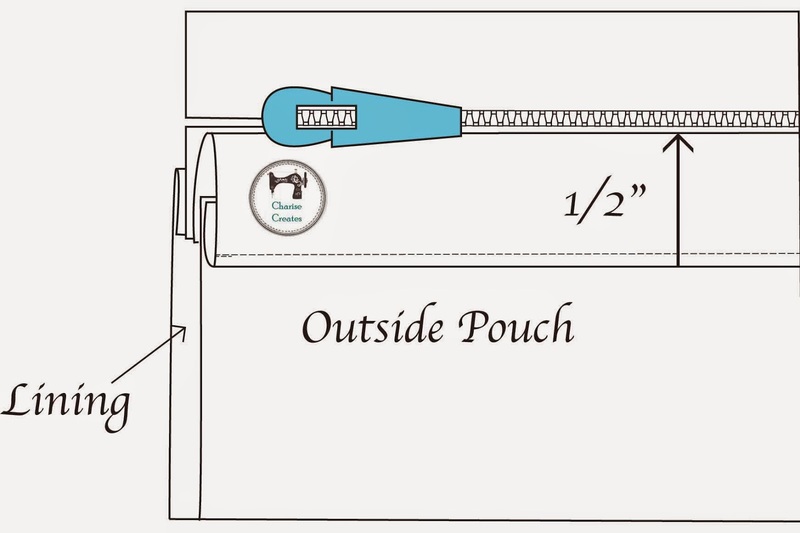 The zipper tape will face towards the pouch panels. Stitch 1/4” around the perimeter of the pouch. Leave a 3” opening on the lining panel. 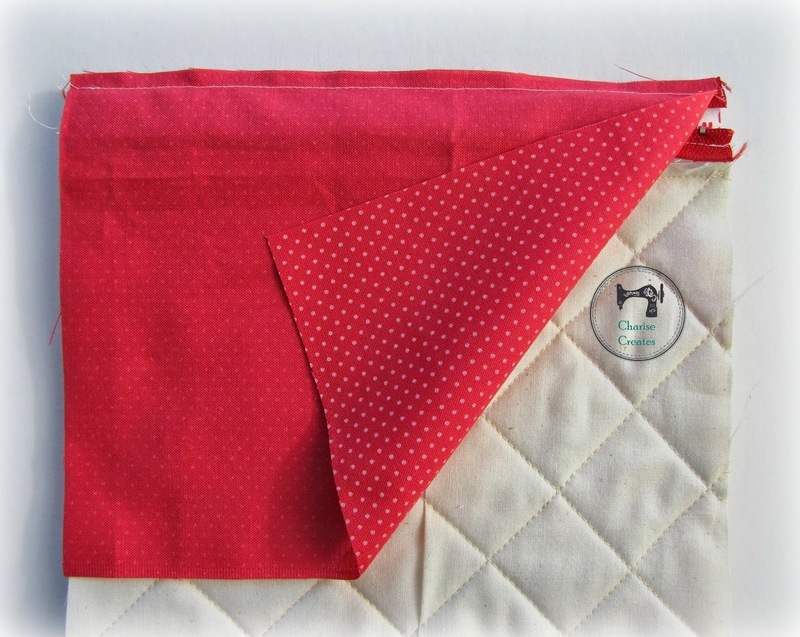 14) Create the bottom corners by placing the pouch corners right sides together matching the seams. Press the seams open. Mark 1" up from the corner. Stitch on the marking. Trim 1/4" beyond the stitching. Repeat for the other side of the pouch and both lining corners. 15) Turn the pouch right side out and give it a good press. Slip stitch or machine edge stitch the opening in the lining closed. Yoo hoo ~ you are awesome!!! You now have a completed twelve patch zip pouch. Enjoy! 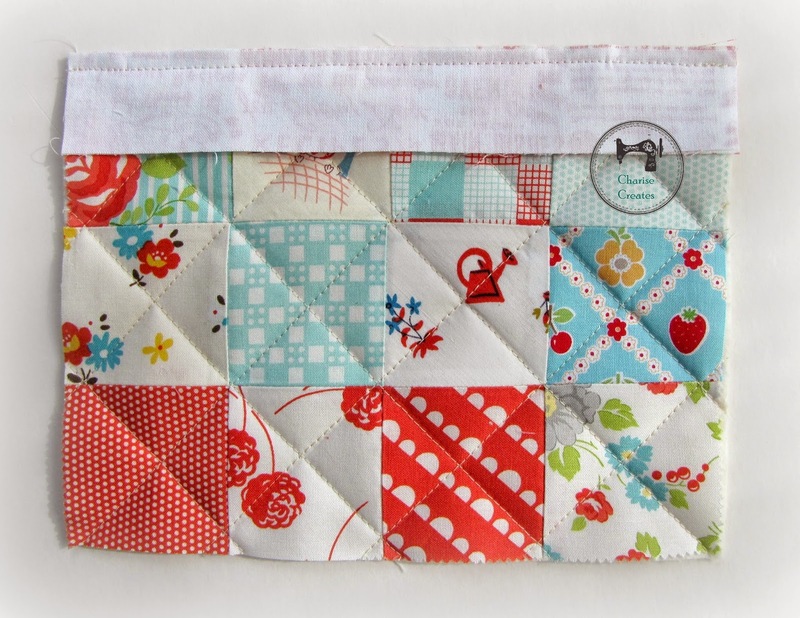 Be sure to share your finished pouches over at my Flickr Group [here]. Thanks for the fantastic tutorial! Aww... This pouch is incredibly cute! Thanks so much for sharing! Thank you for sharing this with us, I love it! Gorgeous, Charise! Thanks for sharing this fun tutorial! So cute! 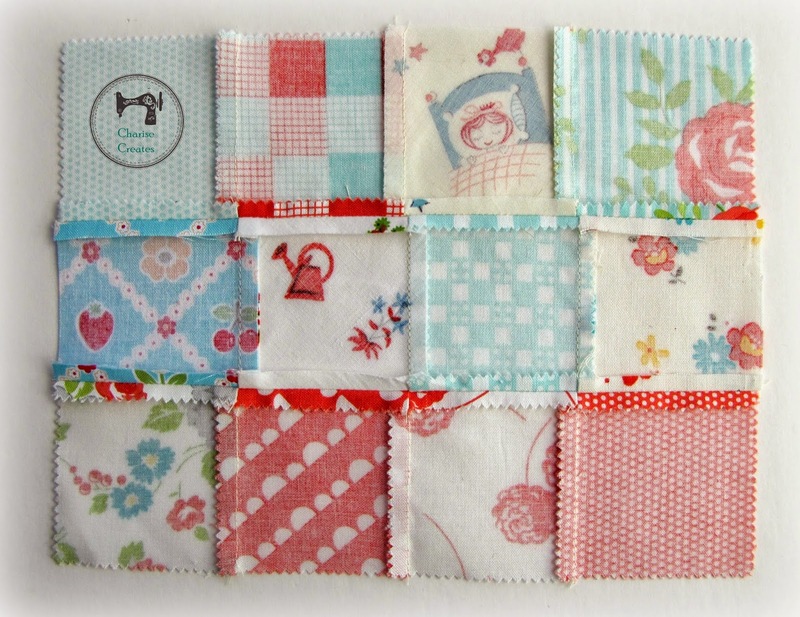 Great idea for using up those adorable 2-1/2" squares. I have several packs piling up. Thanks for sharing! It looks great, I especially like the diagonal quilting through the squares. At first I read that it was a 12 zipper patch pouch, I thought wow! This is really, really cute! I have a few mini charm packs that could use a good home and it looks like this is it! Thanks for the tutorial! Wonderful! I've been wanting to make a zippered pouch. Thanks! These will make such nice gifts. Your site is awesome. Great projects, cheap price :-) and the best instructions. I will certainly try some of them. Thank you so much for your time and efforts. 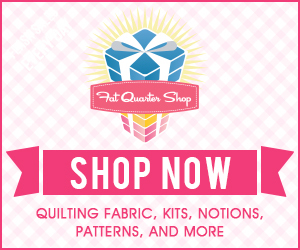 Mother's Day Gifts To Stitch!